Gionee recently launched its latest flagship device, Gionee Elife E6 in India which came with a price tag of Rs. 22, 165 MOP. The phone successfully grabbed enough attention considering the fact the Gionee brand name is only about 6 months old in India. 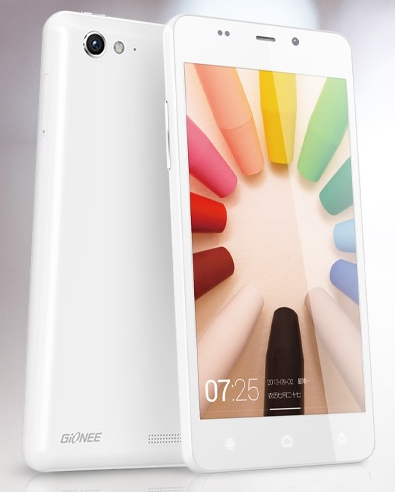 Gionee has now launched Gionee Elife E6 Mini in China!! Yes, it is a trend now and all High end devices are followed by their Mini Variants like recently launched Sony Xperia Z1 F and HTC One Mini, but this is something new for a mid range phone like Gionee. The new Gionee Elife E6 Mini sports a smaller 4.5 Inch display with 720p HD resolution. The chipset is same MT6589T 1.5 GHz Quad core processor. As we have seen with our Gionee Elife E6, we could extract Considerably better gaming performance after rooting Elife E6 and running 720 p HD resolution instead of Full HD and thus if the processor remains same in this mini variant we can expect better gaming performance. The new Gionee Elife E6 Mini will also share the same body design, except for the reduced size. The internal memory will be 16 GB (Not Extendable) and the battery capacity has been improved to 3000 mAh which is more than the Elife E6. This comes at the expense of slightly increased weight of 150 grams and 1mm increased thickness of 8.9 mm. The Primary camera is of 8 MP similar to Elife E5 and is capable of Full HD 1080p video recording at 30 fps. The secondary camera is of 2 MP. Connectivity features include 3G, WiFi, Bluetooth and GPS. 4.5 Inch display is not a considerable cut in screen real state in this Mini Variant and the performance is expected to be similar to Elife E5. The price cut will be marginal too. This phone is currently available in china for around 280 dollars and we expect the India price to be around 15,000 INR.